Native apps are expensive to develop and maintain. Browsers are fairly useless offline. Now there’s a better way. You don’t need any development skills when you use the Formotus service for mobile form creation. 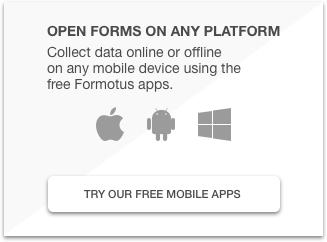 Formotus forms are so powerful they work like apps, even offline. Formotus provides a fully developed and thoroughly tested native mobile app that’s already in your favorite app store (iOS, Android, Windows). Formotus handles all the things you don’t want to worry about such as security, offline file sync, data connections, and cross-platform device integration. This leaves you free to focus on your custom app design — business logic and UI tailored specifically to your organization’s unique requirements. Your solutions can be as simple as a paper form or as sophisticated as a business app with multi-screen navigation, data validation, and all kinds of complex rules and calculations. It’s up to you. 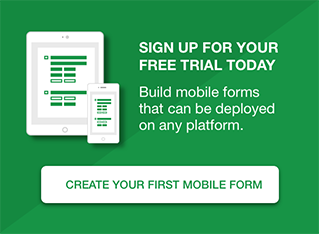 It’s easy to create custom mobile forms with the Formotus creator. Just drag and drop the controls you need to capture signatures, photos, GPS locations, barcodes and more. Then you’ll deploy from the cloud to mobile users on any iOS, Android or modern Windows device. Your form on the device can connect directly to your data wherever it resides: SharePoint, Google, web services, etc. We don’t store your data, you do.